New York : Amulet Books, 2017. Greg Heffley and his family escape to a tropical island resort for some much-needed rest and relaxation, but sun poisoning, stomach troubles, and venemous creatures all threaten their vacation. 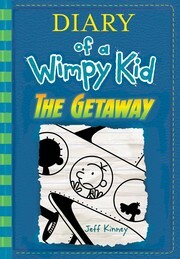 Diary of a wimpy kid : the getaway / by Jeff Kinney. JUVENILE FICTION / Humorous Stories. JUVENILE FICTION / Comics & Graphic Novels / General. $c Statement of responsibility by Jeff Kinney. 250 Edition $a Edition statement First edition. $c Date of prod/dist/manuf/copyrt 2017. 300 Physical Desc $a Extent pages cm. 520 Summary $a Summary, etc. note Greg Heffley and his family escape to a tropical island resort for some much-needed rest and relaxation, but sun poisoning, stomach troubles, and venemous creatures all threaten their vacation. 650 Subj:Topic 1 $a Topical term Humorous stories. 650 Subj:Topic 7 $a Topical term JUVENILE FICTION / Humorous Stories. 650 Subj:Topic 7 $a Topical term JUVENILE FICTION / Comics & Graphic Novels / General. $2 Source of heading or term bisacsh.